"I was born here and I'll die here. I already want to die. Forgive me, I'm drunk. I drink a lot now. We only have what God gives us, our health, our place, our friends." After his wife Natasha died in January 2007, Vasily tattooed her face on his shoulder as a personal memorial. She died from cancer after a long illness, a few days after her 46th birthday. He now lives alone, farming a small plot of land on the outskirts of Ivankiv, Ukraine, the closest inhabited city to the Chernobyl Exclusion Zone. 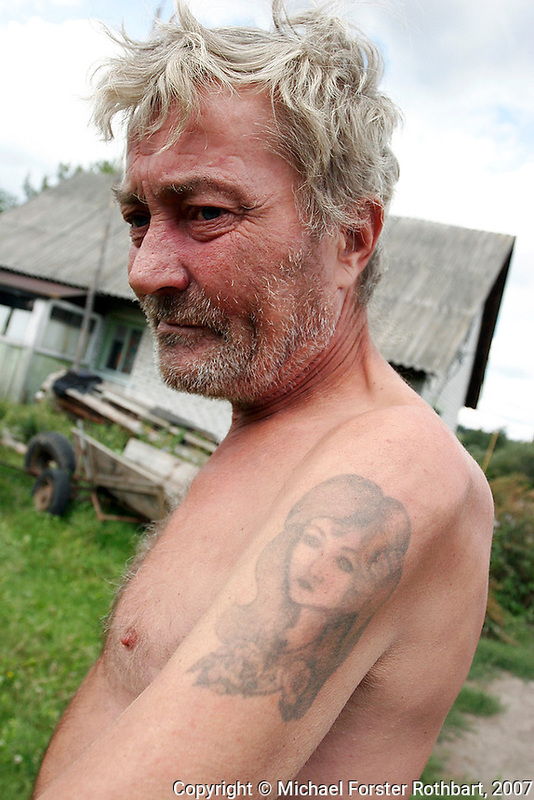 Original caption: .Photo title:.Vasily on his farm in Ivankiv..Caption:.After Vasily Oleksandrovich's wife Natasha died in January 2007, he had her face tattooed on his shoulder as a personal memorial. She died from cancer after a long illness, a few days after her 46th birthday. He now lives alone, farming a small plot of land on the outskirts of Ivankiv, the closest inhabited city to the Chernobyl Exclusion Zone...Quote: . "I was born here and I'll die here. I already want to die. Forgive me, I'm drunk. I drink a lot now. We only have what God gives us, our health, our place, our friends." .-- Vasily Oleksandrovich, farmer.-------------------.